Earlier this year, just before I didn’t do the North Carolina Half Marathon, I wrote about how my running plan had gone slightly awry, and that I was planning on starting from scratch. My “program” was chock full of rest days and not much else. Well, things have gone slightly more awry, if that’s at all possible. But at least I have something new to remind me of past glories. 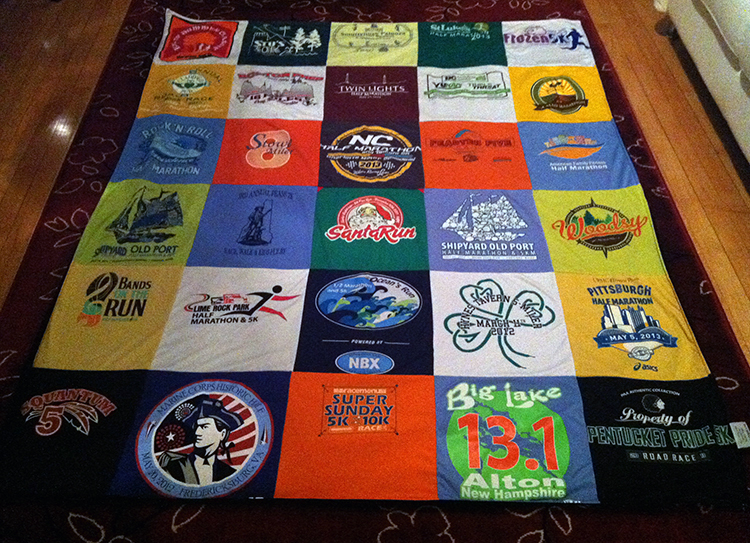 We recently got a second T-shirt blanket from Project Repat, which creates fair-wage jobs in the U.S. by upcycling T-shirts. This one is made of tech shirts, and I love it! The scary thing is that we still have at least another blanket’s worth of shirts thanks to Hubby, who continues to accumulate them at a rate of one a week (and sometimes two or three times a week). And this is after we gave a huge bag of shirts to charity. I think someone needs a run-tervention.